The WFP is sending 800 metric tons of emergency aid to the region, where 12 million people are suffering from hunger. 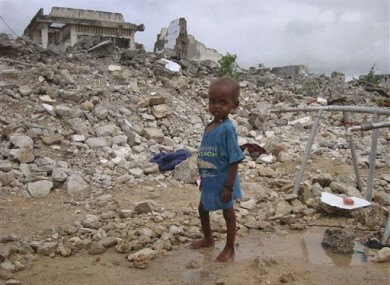 A Somali child from southern Somalia stands in the rubble of a destroyed building near a refugee camp in Mogadishu, Somalia, Tuesday, Aug 9, 2011. THE WORLD FOOD Programme is sending 800 metric tons of high energy biscuits to East Africa to help fight the famine in Somalia. The UN food agency said Tuesday that the series of nine airlifts will be enough to feed 1.6 million people for a day. The biscuits are being delivered to Kenya for onward delivery throughout the Horn of Africa. More than 12 million people are suffering from the effects of drought in East Africa. The US on Monday announced an additional $105 million in aid for famine relief efforts. The top US aid official said during a trip to a refugee camp in Kenya that models show that hundreds of thousands of Somali children could die in the famine if there is not a strong aid response. Email “World Food Programme begins airlifting food to East Africa”. Feedback on “World Food Programme begins airlifting food to East Africa”.